Is the British Economy Finally Recovering? The British government would like us to believe that the British economy is finally recovering after a quarter of 0.6% real GDP growth, which if sustained over a full year would equate to 2.4% annualised real GDP growth. Today’s economic growth figures are encouraging. We are on the right track – building an economy for hardworking people. We are still far below the 2008 peak. Even the United States has done better. Only Europe — which has adopted even greater fiscal austerity than Britain since the slump — has done worse. The truth is that the British economy is in a depression, very similar to the one experienced in the 1930s — what Keynes called a “depressed equilibrium”. The government now — as then — is not taking the malaise seriously, and would prefer to spew meaningless slogans about “building an economy for hardworking people” instead of focusing on job creation, which is the only viable short-term route out of the slump. This entry was posted in Economics and tagged david cameron, economic depression, great depression, jobs, reality, unemployment. Bookmark the permalink. Yeah. This is my conclusion as well, for what it is worth. Trend of GDP growth suggests we’ll be back to 2008 GDP in about 2018. Our GDP curve resembles Japan’s in about 1995 – five years into their 15 year depression. When you compare with GDP tends of 1955-2007 we’re about 12% below the long term trend at present. In 2018 we’ll be about 21% below trend. And this all assumes that there are no more crises or shocks from outside. Yeah this malaise is long term and until people understand its long term, there will be little to no movement. The constant cheerleading from the financial media and Government in both cases is really troubling and many people no longer think for themselves. Another crash is coming, it will be interesting to see what happens. Haven’t included the latest round yet. That would make a great coffee table book. Put me down for one. The worst is over if you see the beginning of this crisis as 1913, or even 1971. 2008 was just the official failure of The System, but it has been in the failure mode for many a decade. “Crash”? Can you be more specific (for UK, EU, USA) — default? bankruptcy? Street riots? Hyperinflation? Is there ANY way that any of the above can avoid disaster, even if they wise up? 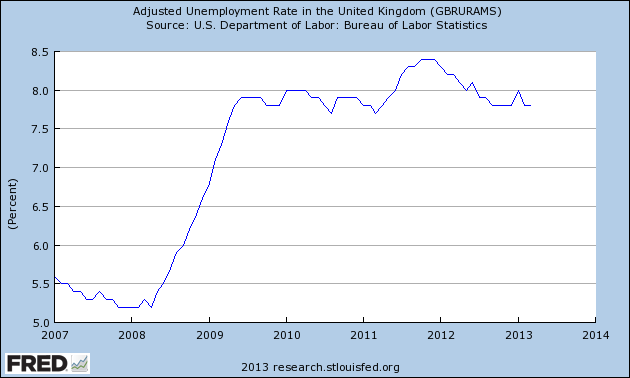 John: are UK and EU government unemployment numbers as misleading as USA’s? Like the USA, UK and EU figures don’t include the full range of people who are out of work; they only include active jobseekers, not disabled people, discouraged workers, etc. Personally, I think that this is the right approach for measuring unemployment, although other measures (e.g. prime-age employment-population ratio) are more useful in capturing certain phenomena (e.g. mass dropouts from labour force) that unemployment figures miss. I believe if we were being intellectually honest, one might consider the depression starting in the early 70’s. If you back-out all of the debt and money-printing that has gone on over the past 40 years, real growth [per capita] has probably been, at best, stagnant. John, do you have any information on such? Don’t alarm the natives. They are restless already. Did the depression begin in the 70s? Well, there was a lot of real growth in technology, skills, output, productivity since then. But the bulk of those gains went much more to a very small percentage of people, what the Occupy people call “the 1%”. I think the seeds of the depression began in the 70s. We still had good growth in the 90s and 00s, but it was based on unsustainable credit expansion instead of sustainable income expansion. Unless you have an equitable income distribution, credit bubbles and busts become hard to avoid. Certainly 1971 was a turning point. No recessions from 1945-1973. In 1971 Nixon pulled out of the Gold Standard, and UK introduced Competition and Credit Control Act. Also Lewis Powell Memo was composed. Basically the world began to dismantle the safeguards put in place after the first Great Depression to stop it happening again. The build up of credit (i.e. private sector debt) began. And now we have the Great Depression II. But no sign of any safeguards being put in place. Thus another crisis is more or less inevitable. John @ July 28 at10:08: I suggest that “technology” (along with associated productivity) deserves more emphasis (a dominant role) in the prosperity of the late 1990s, at least in the USA. The infotech industry came of (profitable) age. A lot of wealth was lost in the bubble-burst starting in 2000, but a lot of solid growth endured. Have you seen this blog on changes to the way GDP is adjusted for inflation? Good comments and links to an explanation and comments by Shaun Richards. Does anyone have an explanation/obfuscation on the US government’s published “inflation”? Social Security payment are indexed to inflation. What is almost never talked about is how those in positions of power and influence [essentially the intellectual and profession classes] say virtually nothing [vis a vis the massive corruption on-going], allowing The Elite to steal everybody blind [including themselves]. No matter the institution, professional people conveniently look the other way,** so that they can live a better life while the vast majority slowly revolve [counter-] clock-wise down the economic drain. **Even in Medicine, you can not believe how many ways there are to rationalize stealing from people who put themselves at the mercy of men and women who, by oath, are sworn to do no harm. THIS is the power of the group to overwhelm individual human compassion, in my opinion, the greatest tragedy of socialized man. (Benghazi negligent homicide and coverup, starring presidential candidate Hillary Clinton; ObamaCare dysfunction — trashing employment, lowering standards, raising costs, reducing supply of caregivers, sowing confusion; IRS partisan tax intimidation and fraud; NSA civilian-spying expansion of patriot Act; “Fast and Furious”; Boston marathon; other FBI and military expunging of Muslim terrorism clues; military Rules of Engagement; support of “islamist” Muslim Brotherhood uprisings in Libya, Syria and Egypt; etc. etc.). Thing is, David Cameron really believes this, just as all people believe most of the non-sense that defines a fair amount of their lives. So, it’s really not about castigating individuals, after all, who among us would be able to stand-up the the entire global system of economics and finance, especially when they will make sure that your family’s needs will be taken care [for generations]? People at this level sell-out all because we are human and [nearly] everybody has their price. So, it would seem to me that instead of concentrating on individuals, we should examine the institutional dynamics which allow such depravity to take place. This inquiry does not happen because people assume that the foundation which supports the super-structure of hope/fear, wealth/poverty, intelligence/ignorance, is never questioned. It is this foundation [that people should get something for nothing] that continues to nurture/give life to ever increasing efficiency in fleecing not only ordinary people, but everybody who participates in, The System. **I once had a couple beers with this VERY wealthy guy [billion+] and listened to how unfair the system was to him and his various adventures. He believed that he had “earned” every penny he had and felt he was being ripped-off by everybody else [particularly, the government, who, of course, clear-cut any resistance in allowing him to work his financial magic]. I just sat there, stunned. More Attaboys, Imp old friend! When (if?) our descendents get around to erecting your statue it should be engraved with “Examine the INSTITUTIONAL dynamics which allow such DEPRAVITY”. As you have read, I contend that the worst (after the bloody elimination of Nazis, Fascists, Imperial Japanese, Soviets, Maoists) is democratic socialism/dependency politics. That is very kind of you, DG, but I have nothing new to add to what has been said over and over again for thousands and thousands of years. “Institutional dynamics” and “depravity” of current US politics: Obama made a long speech (not an interactive Press Conference; those are handled by his “Paid Liar”, Jay Carney) about the economy (“phony scandals” didn’t sell, so this is the diversion). I am not to blame for any economic negatives, I will fix them, more government spending, taxing and regulation is all we need; “Washington took its eye off the ball”, i.e, interrupted my agenda of bankruptcy through socialism with exposes’ of numerous real scandals. This egregious lying to the people — the most audacious since his 2008 campaign — surely qualifies as “depravity”. From my foray into Politics, the current crop are rally that stupid. Having fun on the campaign trail, Buddy? I am only playing with them. I have set a personal goal to get the most votes per dollar spend in the history of Australian politics. One could easily win in politics with enough money but that would not be a challenge right? Sun Tzu meets Aussie ingenuity. I am seeing a very good case for Technocracy. My campaign vehicle, a classic restored Chrysler 1968 Valiant, pictured on the Great Ocean Road, our best spot. Nothing like being on holidays, talking to the locals and ending up in Parliament at the end of it. My first car was a 1969 Chrysler Plymouth Fury III [it used more transmission fluid than gas]. Those were interesting vehicles. So, BR, what exactly are you telling the voting population out there? I know that you know, but may I remind about the importance of making distinctions when campaigning/marketing — in planning and especially in speaking. Like “sick” doesn’t help a diagnosis/treatment, “stupid”, with the same root as “stupor”, doesn’t inform and guide the candidate. Ignorant; uninformed; indifferent; selfish; biased-brainwashed; etc. Maybe take the medieval “Seven Deadly Sins” and add Ignorance. My preceding @July28 at 7:57 pm was, of course, addressed to candidate Buddy, who posted “really that stupid”. Further to Buddy (whom I want to win! ): (1) As Impermanence asks, what are you telling the voters? We Azizonomics colleagues are aware of and largely attracted to your philosophy, but what are you marketing? (2) Sun Tzu: Don’t speculate on the ENEMY’s intentions, but prepare for his capabilities. Good advice, but for non-battlefield conflict, it neglects to mention “Know thy enemy”. I think ole ST did counsel “Know thyself”. You were not inspired by his Tweet? We have the same type of inspiring Tweet from Australian politicians. It is almost as if they came from the same stock. The stock that was kept in corners of castle, unable to mingle with the “common knowledge” instread their lives were entertained by jugglers, midgets, story tellers and other entertainers. They really don’t have a clue! I don’t see myself as a Politician. I see myself as an AP, An Agent Provocateur. By being myself I educate and stimulate the electorate. If I win by being myself, that is not winning by being a Politician, for one is a Politician if one follows the rules of social snakes and ladders. This whole election is like Azizonomics to the masses, and I thank all contributors who have educated me and given insights that will furnish improved lives for my electorate. We are winning, a thought and idea at a time. BR, I admire your idealism, but that’s what they all say. Nobody beats, The System, just as nobody can live outside of the environment. I am listening, and tell them I am here to clean up the mess. I have read the Crimes against humanity section of the Geneva convention and specifically enslavement is a crime against humanity. There is very good argument to indict Rupert Murdoch and other powerful figures for withholding and manipulating the public. Enslaving them so to to speak. Only a matter of time before ideas motivate the masses. If Rupert was wise he would go away quietly and let the truth be told. I am shocked at the amount of people who know what is going on but feel powerless as an individual. It only takes spark and impoverishment to get people into revolutionary meltdown mode. “Let’s not forget that Greenspan pulled the exact same BS before stepping down. He attempted to raise rates and act responsible (as if his legacy wasn’t already etched in stone). So what happened when Greenspan raised rates? The market wobbled and looked set to bend Greenspan over his desk and ream him. Then he stepped down and handed the reins to Bernanke, who stroked his beard and pretended QE was a “new” idea. Now Sir Ben is playing the exact same tune, thinking that his legacy will be anything other than the humor pages of future economic curricula. But it’s all a setup… he’s taking the fall so that Yellen (or whoever) can step up and pretend to “right the ship”. Paper napkin?? ?… 18 months… Bottom Line Thesis??? Unfortunately my Grandfather warned of this 25 years ago and I though he was nuts, but the reality is anybody with saving will have to buy Govt Bonds (Like War Bonds of 40’s) to fund the massive expropiation of the third world plunder, to keep thiese parasites in the game. I won’t win my election, but I will sure make some noise exposing these thieves. And for all the half wits who don’t vote for me, I hope they get what they deserve. Me I am not in it for the money, just my 5 mins to expose these cockroaches. Buddy: I’m not your mother, but I’m more than old enough to be your father, and I want you to go farther and do more than I. So here’s some advice which, hopefully, will apply in Australia as well as the US. I was “always” deeply involved in politics and public policy, but never ran for elective office nor climbed to the top in appointive government. I now know why — too little ambition*/guts (bad) and a stubborn unwillingness to compromise** (usually good). Accept compromise and gradualness EXCEPT on basic principles/values. Jesus’ Sermon*** on the Mount and Jefferson’s**** “eternal hostility against every form of tyranny over the mind of man” cover them pretty well. “I won’t win my election” (your previous post) is nonsense, or at least only temporary awaiting future opportunities. Your Clive Palmer sounds like a damn good leader. Besides media-bias, a big reason the US RDP (Radicalized Democratic Party) prevails is that the GOP has not had a confidant and articulate voice since Reagan. We have no Loyal Opposition with a shadow government, a weakness for the grass roots, e.g., tea parties, to fill. Let’s assume that Impermanence’s “that’s what they all say” (posted earlier) wasn’t doubting YOUR sincerity, but rather a warning that your will face cynical VOTERS’ suspicions of hypocrisy. Remember — emotion, likeability, comfort, etc. are more important in getting votes than reason and logic. Proof: the two most popular US politicians were and are Ronald Reagan and Bill (not Hillary!) Clinton. One stopped ruinous inflation and (with PM Thatcher) ended the cold war; the other was indicted for perjury, lied continuously to the people, and was “poster boy” for adultery and cocaine. Old time “humorists” Mark Twain and Will Roger both effectively critiqued political and private elites with HUMOR, e.g., Rogers’ “The nation is once again in dire peril — Congress goes back into session this week”. Reagan responded to debate opponent Carter’s falsehoods with a smiling “There you go again!”. There are cockroaches and half-wits for sure, but be selective in your utterances! * “A man’s reach should exceed his grasp”: Browning. *** To “add music to the words”, read Kahlil Gibran’s “The Prophet”. **** The FORMER US Democratic Party held annual Jefferson-Jackson Day dinners and honored Truman, Kennedy, and M.L. King, Jr. The current RADICALIZED Democratic Party has dropped them all. HST: “The Buck Stops Here”. JFK: “Ask not what your country can do for you, but what you can do for your country”. MLK:”I have a dream that my children will be judged, not by the color of their skin, but by the content of their character”. The math is really simple actually. If people take away their incomes to pay down debt and spend less(reducing incomes), then where does the money come from to pay the debts? Something has to be sustaining the income level to pay the debts. Either the government has to run deficits or print money. The right thing to do is to slowly cut the deficit while printing money to make sure the income is there. NGDP must not be allowed to collapse. The single most important thing is to keep NGDP growing during a period of deleveraging. That being said, if you just keep running deficits and run up massive government debts in the process a nonlinearity starts to develop. Debt service costs increase exponentially to shifts in your cost of capital while tax revenues grow linearly with respect to inflation. The higher the public debt, the bigger the problem.